I am learning that Care Through Touch is much more than "hands-on work,” it is "heart-work." It is a way of life, a way of "being" in the world. On Holy Thursday April 13, 2017, twenty-four Care Through Touch volunteers gave nearly eighty-some foot massages to poor and homeless people throughout the Tenderloin neighborhood of San Francisco. It was a glorious display of fun and faith; hope and joy; care and love. “This is what makes this day HOLY for me”, said one of the volunteers. Thanks to all; and thanks to ALL who have participated in the past twenty-four Holy Thursdays!!! Fifteen years ago I received a present. It was a book titled “Care Through Touch: Massage as The Art of Anointing” by Mary Ann Finch. Right then and there, it planted the Care Through Touch seed in my heart. Fast forward to November 2014, I found myself participating in an Immersion Day at CTI as part of a Sabbatical program I was attending at the School of Applied Theology in Oakland, CA. That day, spent among the homeless community in San Francisco, brought the incubating seed to the surface. In the words of the Irish poet Seamus Heaney, “my heart was caught off guard and blown open.” As a result, I began the training program in January 2015. I am learning that Care Through Touch is much more than "hands-on work,” it is "heart-work." It is a way of life, a way of "being" in the world. To be truly connected with the person who comes to me for massage I need to realize that what this person needs from me is my heartfelt presence. CTI challenges me to look beyond the outward appearance of the person who is present with me, to see beyond the sometimes delusional, angry, manic, depressed, addicted behavior, and let my heart work through my hands. There are moments when I come up against my own fears, insecurity and prejudices. But I have learned that these moments are an invitation to respond both to myself and to the other person with kindness and compassion. Compassion waters the CTI seed in my heart. Finola Laide is from Ireland and a CTI intern. The purpose of this BLOG is to introduce you, the reader, to some of the most resilient, loving, generous women and men, who, in spite of all odds, are making their lives 'works of art!’. All have been TOUCHED by the hearts and hands of CTI’s Care Through Touch practitioners. “It’s the love you all put into the massage that makes it different from any other kind of massage I’ve ever received” said one faithful recipient. It’s not only what Care Through Touch has given these women and men, but even more, what they have given to CTI; and now through their stories to you the reader, and the world. As the saying goes, “I may be down, but I’m not out.” Here you will feel the truth of these words. We begin this blog by introducing you to Jackie Zusman, a 67 year old woman we met through our Comfort, Care & Companioning Program. Today she is the ‘protector’ of this newly birthed program. In journeying with her over a few precious months, five to be exact, she showed us what a ‘warriors’ spirit is truly made of. Jackie had bone marrow cancer that metastasized throughout her body. Every movement was etched in agonizing pain. But she craved the tenderness and intimacy of soothing touch. Jackie was a magnet. Everyone who came into her presence was TOUCHED by her openness to life at that very moment, be it her satisfaction with a cigarette, a cup of coffee, the sound of her parrot, the footsteps of a friend coming down the corridor, the in-home-health women who chatted and loved her up, her long-time beloved friend, Oscar! To be honest, I believe we were all hoping we could push the inevitable march of her illness back behind the borders it was racing towards. But the time came when we were all powerless in the face of this monster disease, including Jackie herself. The pain was excruciating. No amount of morphine could silence it. “It’s time to go’ said the hospice nurse. And on the morning of February 28, she moved from the Empress Hotel in the Tenderloin to Coming Home Hospice a few miles away. 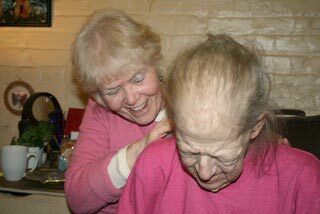 The following afternoon I went to visit Jackie, and she gave me the greatest gift of my life yet in Care Through Touch – she died peacefully with me by her side. As I approached the door of her room, a nurse who was fixing her bed pillows, noticed a sudden change in her breathing. "I think she's making the transition,” she said to me as she left the room. That quickly! I was stunned! From that moment on, GRACE took over. I stood beside her bed and called her name, she opened her eyes wide reached for my hands and pulled me to her. I was both surprised and a bit scared by her strength. She attempted to say something, but it was impossible to understand. The nurse sedated her again, but her anxiousness continued a few moments longer. One of my mentors, Roshi Joan Halifax has written a book entitled Being With Dying: Cultivating Fearlessness in the Presence of Death. Her book is the foundation of a training program in Buddhist Chaplaincy. In it she speaks about the three requirements necessary in BEING with (note: not WORKING with) dying people: resting in not knowing, bearing witness, and loving action. As I reflect back over my experience that afternoon, I can see elements of all three. The most important lesson for me was: to get out of the way! "Let go, and let God!" What a sacred journey this has been. 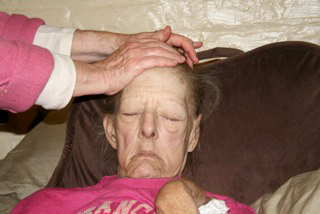 We have dedicated our Comfort, Care and Companioning Program to Jackie!